The digital input module MV110-24.16D(DN) has 16 digital inputs on board which are implemented as switch contacts, NPN or NPN/PNP, depending on variant (D or DN). In addition, the MV110-24.16DN version has galvanically isolated inputs in groups of 4. 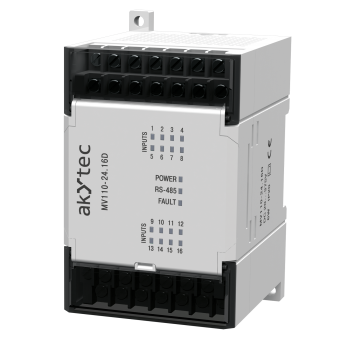 The module requires 24 V DC power supply and supports Modbus RTU/ASCII communication via a serial RS485 interface. The enclosure provides IP20 rating and can be operated in the temperature range between -20 and +55 °C. The I/O Modules of Mx110 series offer a cost-effective and flexible solution in distributed automation systems. The robust modules carry out on-site measured value acquisition and process control and are very suitable for extension of existing systems as well as for creating of new high-performance systems. Due to the proven RS485 bus technology and intelligent functions, such as pulse counter or sensor state diagnosis, the MX110 modules can be used in different fields, such as building technology, process industry, etc. No bus coupler or power supply unit is required, like in other decentralized I/O systems. Each module has all comunication and power supply units on board. Thereby also systems with a small number of I/O points can be economically reasonable.